Nearest weather station, with distance and direction from RNA: The NOAA weather station is located at Alexandria, LA, 50 miles (80 km) from the RNA. The length of the record is 29 years. Annual precipitation (type, seasonal distribution): The mean annual precipitation is 55.9 inches (1419 mm), with the largest amount occurring in December and the smallest amount occurring in August. Maximum and minimum temperatures: The mean annual temperature is 19.2°C (66.5°F), with a mean maximum of 25.4°C (77.7°F) and a mean minimum of 3.2°C (37.8°F). Elevation: The elevation of the area ranges from 93 to 100 ft (28.3 to 30.5 m). Geology and Soils: The area consists mainly of recent alluvial deposits and some Pleistocene terrace deposits around the north, south and west borders of the RNA. The predominate soil in the area is Perry clay. Guyton-Cascilla soils are also found in the area. The terrain of the Cunningham Brake RNA is uniformly flat. Aquatic Features: Kisatchie Bayou is located along the north margin of the RNA and there are numerous small streams flowing through the area. There is standing water in the cypress swamp most of the year. Plant Communities: The RNA is a relatively undisturbed large contiguous area of bottomland hardwoods, with large baldcypress (Taxodium distichum) and water tupelo (Nyssa aquatica) trees, some over 100 years old. At Risk Species: The three birds orchid (Triphora trianthophora), a rare species in Louisiana, occurs in the Cunningham Brake area near Kisatchie Bayou. Common Shrub Species: Common shrubs in the area include Virginia willow (Itea virginica), buttonbush (Cephalanthus occidentalis), cane (Arundinaria gigantea), and possumhaw (Ilex decidua). Common Herbaceous Species: 313 plant species have been identified in the RNA. Common species include water willow (Justicia lanceolata), trumpet vine (Campsis radicans), blackberry (Rubus arbutus). Common Bird Species: The RNA is a migratory waterfowl resting area and supports a wild turkey (Meleagris galopavo). Mathies, P. S. 1978. The vascular flora of Cunningham Brake, Kisatchie Ranger District, Kisatchie National Forest, Natchitoches Parish, Louisiana. Ms. Thesis, Northwestern State University. 32 pp. Mathies, P.S. ; Holmes, W.C.; Allen, A.A. 1983. 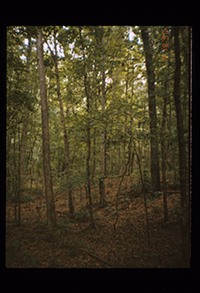 The vascular flora of Cunningham Brake, a cypress-gum swamp in Natchitoches Parish, Louisiana. Castanea 48: 24-31. Allen, C. (1993). Ecological assessment of the Cunningham Brake Research Natural Area in the Kisatchie National Forest, Louisiana. Unpublished report. Northeast Louisiana University, Department of Biology.